Viral Warts on the feet or hands are probably more common than most people realize. According to WEB MD, most people will get a common wart on their hands at some point in their life. The cause is simple, the HPV virus gets into the outer layer of skin and causes rapid growth is the tissue thus creating the wart. It’s unavoidable, at some point by normal contact with other people and items you will come into contact with the cause of the warts virus. Even though most cases of human papillomavirus (HPV) are completely benign and don’t pose much more than a mild cosmetic problem or slight irritation, they can still be a serious nuisance if left untreated. HPV is not contained to being just a sexually transmitted disease. This article does not focus on the STD type of warts (genital warts). There are over 100 different types of HPV, each with its own unique causes and behavioral pattern. Most types of skin warts will generally resolve themselves after enough time has passed, but with certain salicylic acid and freezing treatments, the healing process and wart symptoms can be expedited significantly. If you’re like most people and you don’t want to begin with the doctors office than you have a few options for at home treatment options. You can start with home remedies such as duck tape and apple cider vinegar and hope for the best or you can start with the most effective wart removers that contain medicine, but still are over the counter treatments. The following ways to treat warts products have been rated by many customers as some of the most reliable over-the-counter treatment options available. Keeps in mind how to use wart remover may vary from product to product. These are medicines and the instructions need to be read and followed before use. What does wart remover do? What do removers do and what is the most effective wart remover, depending if you go with the best ointment for warts or a freezing treatment the results are actually very similar. If used properly the salicylic acid will cause thinning of the skin where the virus has infected the outer layer that caused the excessive growth. As the thinning occurs your body will go to work fighting the infection while sloughing off the skin the salicylic acid has helped to thin. If successful this process will continue until the wart has completely sloughed off. The key to the first treatment is soaking the effected area and using a file or stone to open the pores up before applying the medicine. Unfortunately there is no wart virus cure, it is more of a treatment of the wart virus symptoms, trying to beat the wart itself. Your bodies immune system will have to fight the HPV virus, but the acids, ointments and freezing can help speed up the wart removal process. According to Dermatology News, Salicylic acid is the winner in a head to head study vs Cryotherapy. Not because it was the most effective wart remover for over the counter treatment but instead because it was the least expensive when seeing a doctor with the same outcome. Ointment with Maximum Strength fast acting gel made for removing different types of skin warts. Some examples it may be used for are common and plantar warts in a painless fashion. The fast-acting gel is designed for instant activation and is contained in a squeezable dispensing tube. While applying the product, users should make sure to keep a small amount of pressure on the tube in order ensure that there won’t be any unwanted air that gets absorbed back into the tube – getting too much air into the tube of any wart removal product can quickly diminish its effectiveness. One reviewer testified that Compound W was an effective way for their husband to get painless relief from his persistent mole problem, but the issue of their husband’s skin tags was another matter entirely. The reviewer testified that if any prospective owners want to use the product to get rid of their skin tags, they’re going to have to prepare for a little bit of pain. According to the reviewer’s report, the product takes about 3 months on average to remove skin tags. The reviewer stated that when the skin tags are in process of being removed, there tends to be a slight bit of bleeding and a mild burning sensation. The instructions do not recommend using for moles. After the moles or skin tags have been removed by the product, the reviewer suggested that people using the product for the first time might want to use an antibiotic ointment on the treated area until the skin has completely healed. One customer testified that they had successfully used Compound W to remove their warts and all twice. Even when the medicine that had been suggested by their doctors had failed to give them any sufficient relief, they were able to gain relief by using Compound W to finally eliminate a wart that had been steadily growing in size after each unsuccessful removal attempt. The customer reported that it only took about 72 hours for Compound W to completely remove the warts without any signs of them coming back. Another user of the wart removal product testified that before finding out about Compound W, they had only been familiar with methods of wart removal through bandage strips. The user had attempted bandage strip treatment on two troublesome skin warts that had formed at an unusual position on his knuckle, and they were constantly frustrated at how they needed to cut the bandage strip to an exact measurement that correctly matched the affected area. Some of the bandage strips the customer had used were impossible to cut properly, due to the fact that non-affected areas would be corroded by salicylic acid that wasn’t needed. Even as the wart died down, the bandage strip would become less of an optimal fit for its shrunken size, somewhat canceling out the effectiveness of the treatment overall. The customer struggled with bandage strips for three years in a row, constantly having to deal with the warts recurring after three months, before finally deciding to try Compound W. After giving Compound W a shot, the user no longer had to worry about any of the irritating hassles that bandage strips had put them through. In another testimony, a customer testified that they had been able to use Compound W in order to find relief from a wart that had been tormenting them for over 5 years straight. Even after trying multiple freezing products suggested by their doctor, nothing had been able to give them the relief that they were after. Eventually, the customer stumbled onto Compound W and decided to try using it alongside a slight application of duct tape. After using a daily combination of Compound W and the duct tape for just a single month, the customer reported that the wart was completely gone. A single tube of the product should last for about two months on average, if used every day. The best way to ensure that the full benefits of the product manifest are to use it consistently. According to the testimonies, users have found that the most optimal time to apply Compound W is at night. After the nightly application, users should allow the application to steadily dry out as they sleep. It’s important to note the instructions say not to use on warts on face and not for genital warts. 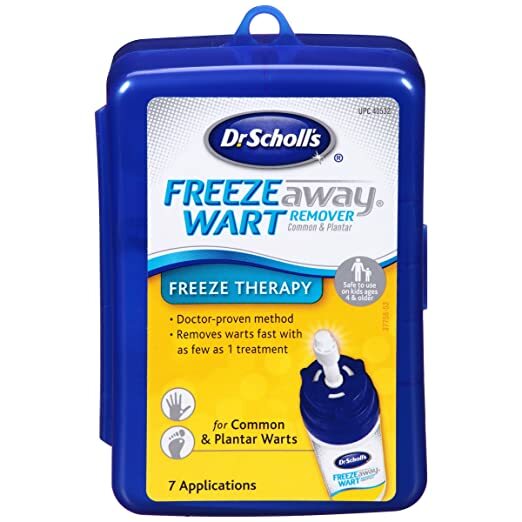 Dr. Scholl’s Freeze Away Wart Removing home treatment is designed to gradually diminish warts over the course the of several weeks, through there are some who have experienced relief in an even shorter time frame than that. In order to use the product, the user first needs to screw the tip into the can. After screwing the tip into the can, the next step is to push the can into the blue activator. After pushing the can into the blue activator, a fine spray of the freezing vapor should be dispensed from the can. While the cryo-fluid is being dispensed, the wart itself should not be touched. The freezing cryo-fluid should be applied to the applicator on the stand, with the can upside-down, until it becomes sufficiently coated. After the applicator has been thoroughly exposed to the cryo-fluid, the applicator can be applied to the effected area for approximately 3 seconds. Customers should be advised that the product is highly flammable, so users should make a point not to handle or apply the product near any open flame sources. It’s important for customers to make an effort not to pressurize or pierce the can, even if they’ve already finished using it. Customers should also make a point to refrain from smoking while using the product. The container should be kept out of direct sunlight as much as possible, and it shouldn’t ever exposed to any temperatures that are higher than 120 °F. Ideally, the container should always be kept at a moderate temperature between 68 °F and 77 °F. If the container is exposed to any extreme temperatures, then there’s a chance that the container might explode. The product should only be used externally, and only in a well-ventilated area. The vapor from the product’s spray shouldn’t be inhaled under any circumstances. If a user makes the mistake of using the product in a way that isn’t it isn’t explicitly meant to be used, then they might be at risk of giving themselves painful burns, serious scars, or even blindness. The product can be used for the successful removal of skin tags if the user wishes, but certain precautions should be taken in order to ensure that the skin tag removal process goes as smoothly as possible Some customers suggest that the best way to use Freeze Away for skin tag removal is to position the skin tag parallel to the ground (if possible), apply the freezing solution to the middle of the tag, and then simply wait for the skin tag to drop off on its own; this may take a number of sessions before the tag has been completely coaxed away. Other customers have testified that optimal skin tag removal can be achieved with the use of duct tape, but naturally, this will depend on your personal level of pain tolerance and skin sensitivity. After successfully using the product to freeze off a wart, some customers testified that there was a small, red, dime-sized blister left in place after it had been completely removed. The resulting blister is reported to typically disappear after 7 to 10 days, though it’s possible for the blister to last even longer, so customers should be prepared to allow a generous grace period to transpire before making a judgment. Before using Freeze Away, be sure to consult your primary health care provider (or any accredited dermatologist) in order to confirm whether or not your particular case should be froze away. 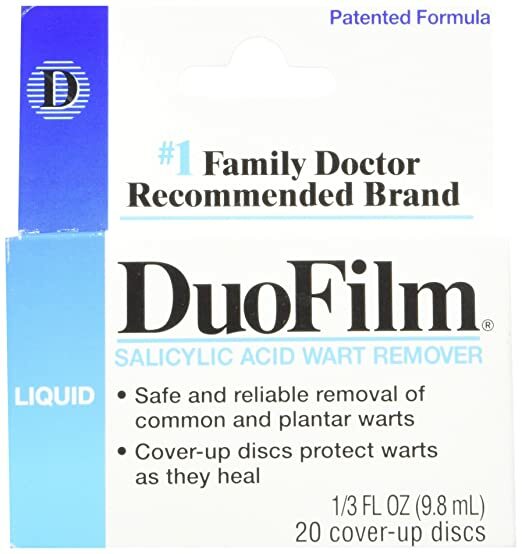 Duofilm Liquid Salicylic Acid falls into one the best Wart Remover over the counter catagory type products. It is made for the removal of both common warts and plantar warts. The removal process is enacted by using small adhesive plastic discs, affixed to the skin, which should ideally take the target away with them upon removal. Like most other high-end wart removal products, customer testified that Duofilm has been the only treatment they’ve been able to get consistently successful results from. The customer had been suffering from two plantar warts on the bottom of their big toe, and three skin warts between the webbing of their smaller toes. The customer found that the best way to apply the product was by applying the product twice a day. After the initial application of Duofilm, the customer advises that other users make sure to wait for at least 10 minutes until the application completely dries. After the first application completely dried out, the customer then proceeded to administer the second application; this was typically enough for them to complete remove without causing much of an issue. In their testimony, the customer also advised other prospective users to pay special attention to whether or not the bubble of dried product pops or oozes, in which case they should wait just a little bit longer. Once the wart has been completely removed, any dead skin around the affected site can be carefully removed with nail clippers. As another safety measure, users should make sure that they don’t pick at any of the dead skin with their fingers. The viral elements responsible for HPV can be transmitted via skin contact, and if you get any of the viral elements from your wart site onto your fingertips, you run the risk of accidentally spreading the warts to other unaffected areas of your body. Make sure that you always clip the dead skin around the wart site over a disposal container, and also that your hands are thoroughly washed at the end of the process. Another customer, a parent, testified that Duofilm offered their child relief from warts that couldn’t be achieved with any of the products that they’d tried from their local pharmacy. The pediatrician of the customer’s child suggested Duofilm. The wart that had appeared on the customer’s child had proven to be highly persistent, and the customer wanted to ensure that it could be removed in the two weeks prior to the beginning of the school year. Like most other users, the customer went about using the product by peeling off the layers with tweezers. The customer was delighted to find that for the first time in weeks, the persistent wart was finally beginning to show signs of dwindling. By the time that school finally began for the customer’s child, it had already dwindled down to a size where it was hardly noticeable. Under no circumstances should the product be used anywhere on the face. If the product gets into the user’s eyes or mouth, there’s potential for serious health complications to occur. As long as the proper precautions are taken, there shouldn’t be anything for the user to worry about. 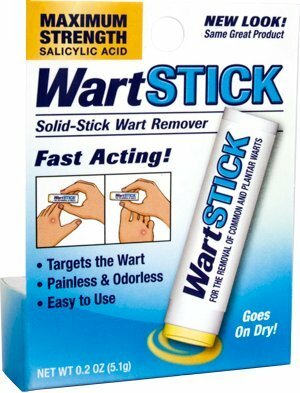 WartStick a maximum strength, fast-acting wart removal product meant to be applied completely dry. The product is colorless, odorless, and has 40% salicylic acid. It’s primarily meant to be used for the removal of both common and plantar warts. One customer testified that they found WartStick after going to their local pharmacy and finding that all of the freeze-off wart removal products had been sold out. The customer was essentially flying blind with WartStick, but for the price, they were willing to find out just how effective could be. The customer applied the ointment around a the effected area on their finger before going to bed. In the morning, they realized that they had applied a slightly excessive amount of the ointment on their good skin around the wart, which turned the good skin white. Fortunately, the discoloration only lasted for about 24 hours. The customer was pleased to find that after peeling back the skin, the wart was completely removed along with it. Because even the roots of had been removed, all that was left in the place of the wart was a small red dot. Another customer testified that they had been struggling to deal with a plantar wart on their foot that hadn’t been responsive to any of their attempts to trim the skin off as it continued to grow. After using the WartStick consistently every morning, for just a few weeks, the customer was pleased to find that it completely disappeared without a trace. Months after the initial disappearance of the wart, the customer found that there wasn’t any sign of reappearing at all. Though the customer hadn’t always been the best as staying on top of daily medication, the chapstick-like application of WartStick was very easy for them to develop a consistent habit out of. Another customer who had also been suffering from a plantar wart on their foot found that WartStick was the most efficient and painless removal product that they had used. Different variations of wart removal products may often have differing levels of salicylic acid in their ingredients. Salicylic acid is an organic, colorless phenolic acid that’s commonly used to address plantar wart breakouts. Salicylic acid should ideally cause warts to peel off with minimal resistance, but depending on the exact amount of salicylic acid in the removal product, the results may vary. People with salicylate allergies may have adverse reactions to the salicylic acid content in removal products, so before committing to purchase, it may be wise to consult your primary health care provider and dermatologist to discuss the chance of any possible allergies. To get the most value out of your removal product purchase, you’ll naturally want to make sure that the product you decide on is meant to last as long as you need it to. Different people will have different patterns of their wart breakouts, and this should be a factor that’s taken into account when considering which product will be the best fit for the usual timeline of your unique condition. Be sure to ascertain whether a removal product is designed for instant-release action or delayed activation. A dollop of one product might equate to an entire handful of enough product, depending on just how strong they are. You’ll be able to get the most value out of your removal product if you compare how much you need for a single application. The recommended dosage will directly play into how much exposure you have to the other ingredients in the wart removal product that may or may not interact with your body in an adverse way, so being critical about the recommended application amount is just as much a matter of safety as it is a matter of smart shopping. It’s extremely important to confirm that the wart removal cream you settle on has been intended for the treatment of the exact type of warts that you’re targeting. Many people with problems wind up sabotaging themselves by using removal products on certain types of warts that customers are actually advised to refrain from using the product on in any capacity. Be sure to accurately identify exactly what type of warts that are causing your problems, and after you’ve done that, you’ll be in the perfect position to combat those warts with a product that can be relied upon to diminish them instead of exacerbating them. Even though warts can pose a profoundly persistent and frustrating problem, the right removal product can create worlds of difference in a non intrusive fashion while providing benefits to the skin at the same time. On the other hand, choosing the wrong wart removal cream could potentially result in consequences that far outweigh the scale of the original problem. Paying attention to the ingredients, activation time, and any possible benefits or side effects will help you make the safest, surest, and most effective wart remover and dealing with symptoms. If the above products do not work remember that doctors have other options such as wart surgery. Even though it may sound scary I assure you that the removal of warts through surgery is performed often and is simple procedure.